Rabat - World athletics chief Sebastian Coe has told AFP he wants a radical review of track and field to ensure it survives as a spectator sport. With the sport's biggest star Usain Bolt retired, IAAF president Coe said he was considering anything from franchised teams bidding for athletes to pop-up tracks in streets and football stadiums to attract new fans. "Nothing's off the table now. Let our imagination run wild," the two-time Olympic gold medallist said in an exclusive interview as he warned the candid discussions will be "uncomfortable" for purists. Following the success of the World Championships in London this year, there are fears the next edition - in Qatar in 2019 - will not draw the same crowds or worldwide interest, particularly as Bolt hung up his spikes after London. The Jamaican sprinter has been a shining light in recent years for a sport in danger of losing its appeal because of the Russian doping scandal, lengthy championships and over-complex formats for spectators. "We are in the entertainment business and we have to look at it in that way," Coe said at a meeting of African athletics federations in the Moroccan capital Rabat. He laid out plans for a "strategic review" to show "what our sport will look like for the next 30 or 40 years". Voted president of the International Association of Athletics Federations in 2015, Coe led London's successful bid to host the 2012 Olympics. The former middle-distance runner said track and field bosses could draw inspiration from cricket's Indian Premier League (IPL) - in which players are auctioned and divided among franchises representing cities - or the NFL, where teams pick players through a draft system. "I think we've just got to allow some really open discussion about what our sport looks like. And yes, maybe it's cities, maybe it's franchises, maybe it's auctions like the IPL, maybe it's the pick." 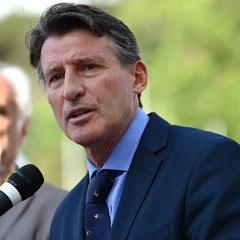 Coe, who won Olympic gold medals in the 1 500m in Moscow in 1980 and Los Angeles in 1984, said tinkering with individual track and field events would not be enough to bring about the fundamental change that is needed. He said his association was already working with different formats, such as holding events in the mountains, trail-running and even parkour - or street-running - where participants leap from buildings and scale walls. "I think there is a need for probably a two-year deep, deep dive because the risk in the past is that we have looked at different elements in isolation," he said. "We've looked at one event and spent a lot of time talking about one event... but we haven't brought it together." He said although it was important to "have the purist argument" and keep the sport's multi-disciplined "philosophy", it can be moved away from its traditional arenas. "I think we need to think across the landscape," he said. "What about pop-up tracks? What about having a 300m track that you put in the middle of the pitch at (Chelsea's stadium) Stamford Bridge or in a football ground in Australia? "Does it have to be a 200m track indoors? Street athletics, taking athletics to where the people are. "I want there to be a ferment of thinking now, because this is where I think we can actually raise our aspirations and our ambitions. "I think we have to have very open and candid discussions and sometimes they are going to be uncomfortable."